Two high-ranking Russian diplomats are due to hold talks with representatives of Syria’s opposition in the run up to the international peace conference on Syria in Geneva, brokered by Russia and the US. Russian deputy foreign ministers Mikhail Bogdanov and Gennady Gatilov will meet with representatives of two Syrian opposition groups to join the discussions from Paris. “One of the groups is the National Coordination Committee. They will specially arrive to meet with us,” Bogdanov said. “We would like the Syrian opposition to be represented adequately and in full at the conference,” he added. The international conference on Syria is due to be held in Geneva this summer, although no dates have been set. “Before discussing the time frame of the conference on Syria one should decide on the substance. At least – who exactly will represent the opposition,” Gatilov wrote on his Twitter account. Earlier this month, Gennady Gatilov and Mikhail Bogdanov met with the US and UN delegations to discuss the preparations for the conference to set the format of the conference. UN/Arab League envoy Lakhdar Brahimi is starting a round of preparatory talks with US and Russian officials in Geneva on Tuesday. 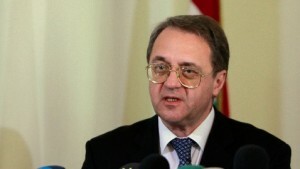 Before the talks in a press conference, Brahimi urged Russia and the US to act quickly. “I very, very much hope that the governments in the region and the big powers – particularly the United States and Russia – that they will act to contain this situation that is getting out of hand not only in Syria but also in the region,” he said on Tuesday. Last week, speaking at the St Petersburg International Economic Forum, Russian President Vladimir Putin warned of a possible political vacuum and slammed Western military support for the Syrian opposition. The Russian leader said it was unclear where the weaponry and money the West provides to the opposition will end up, since one of the opposition groups in Syria – Al-Nusra is recognised as a terrorist organisation by the US. The pressure has been rising on Russia to diminish support for the Assad government. At the recently concluded G8 Summit in Northern Ireland, Canadian Prime Minister Stephen Harper made it clear that few G8 leaders expected Putin to change his position. “I don’t think we should fool ourselves. This is the G7 plus one,” Harper said. “Unless there’s a big shift of position on his part, we’re not going to get a common position with him [Putin] at the G8,” he added. In May, Russian Foreign Minister Sergei Lavrov and US Secretary of State John Kerry proposed holding a second international conference on Syria. The planned gathering has been dubbed “Geneva 2” because the first conference on Syria was held in Geneva last summer.